With a significantly wider cutting edge than the regular size 10, this blade is used to shavedown matted dogs. The additional width is especially advantageous when clippingdown large matted breeds. Built in AgION Antimicrobial protection reduces the growth of a broad range of bacteria, mold and mildew. Blades are cryogenically treated for additional wear resistance. Cutting length: 2.4mm. 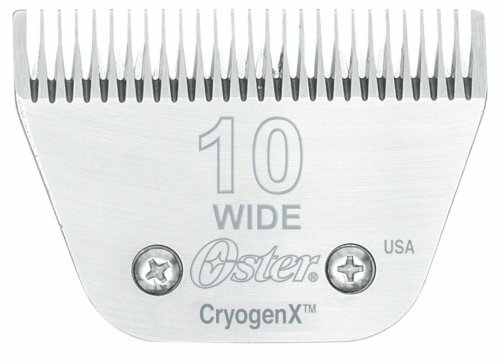 Oster Cryogen-X clipper blades are optimized for strength and durability by subjecting them to a deep freeze tempering process. This dramatically increases the steel's durability, prolonging the blade's cutting performance. Large numbers on blades make identification easier. Oster uses cryogenic technology to create the hardest blades ever. Cryogenic processing conditions metal to 300 degrees below zero, so molecules are aligned in a perfect structure. The result is a harder, denser metal that holds a sharper edge through prolonged usage. A5 Cryogen-XTM Blades also withstand more sharpening treatments for unsurpassed longevity. Sharper blades glide through coats with less effort, saving you and your clipper from unnecessary fatigue and wear. Cryogen-XTM Blades are manufactured from fine-grain, high-carbon steel that is cryogenically treated. With a Rockwell Hardness rating of 62, these durable blades were designed with the busy groomer in mind. Blades stay ultra cool for optimum durability.